When is a Coffee Spot Update not a Coffee Spot Update? While it’s a question that probably only I care about, it arises in the case of Stoney Point, tucked away on Brighton’s Montpelier Place. Readers with long memories will recall that this was once home to Mr Wolfe, a delightful coffee shop specialising in homemade cake, which I visited in 2015. Shortly after my visit, Mr Wolfe’s owner, Travis, returned to Australia, selling the business to the current owner, who, aside from the name change, has kept things much as they were, something I discovered when I finally returned to Brighton at the end of last year. Like Mr Wolfe, Stoney Point serves a concise espresso-based menu using coffee from veteran roasters, Monmouth. Best of all, it’s kept the friendly, neighbourhood atmosphere that made Mr Wolfe so welcoming. If you’re hungry, there’s a range of cakes, and that’s about it. 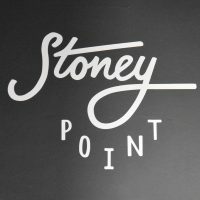 Stoney Point is on the Hove side of Brighton, on the next street back from the main east-west artery, the Western Road. A stone’s throw from Small Batch Coffee’s lovely Norfolk Square branch, Stoney Point is just a little off the beaten track, making it a quiet alternative to many of Brighton’s bustling coffee shops. There’s not a lot to Stoney Point. Essentially a cube, its deeply-recessed door sits between two windows that stretch almost from the floor to the ceiling. This means that it’s very bright inside, and, thanks to lots of bare light bulbs, it’s just as bright when the sun’s gone down. The door is sufficiently recessed that, as you enter, you pretty much step right up to the counter. A wooden affair, with a large display cabinet for the cake, it occupies the back of the store, running almost its full width, with just enough space on the left to allow access to the stairs. These run for about two-thirds of the width of the store, but only lead up to the toilet. However, to the right, this leaves space for a little kitchen which extends behind the espresso machine. There’s not much seating at Stoney Point, and most of what there is feels as if it’s behind you in the two bay windows. A padded bench-seat runs along the left-hand wall and into the first of the two bay windows. This has three small, round tables, each with a low stool. Opposite it, against the right-hand wall, is a two-person padded bench with its own table, while the window has a two-seat window-bar. In all, you could probably sit 12 people inside if everyone shares. There’s also a bench outside the left-hand window if that sort of thing takes your fancy. The décor is very simple: black, except for the right-hand wall, which is white. The contrast is striking and effective, especially since the menu is chalked in white on the wall behind the counter. Despite being small, the high ceilings and large windows make it feel spacious and roomy. To mark my return, I decided to have a piccolo and a slice of panettone (since it was almost Christmas). Although the range of cakes isn’t quite what it was in Mr Wolfe’s day, another thing that hasn’t changed is the generous size of the slices. My slice of panettone was massive, and it was as good as it was big: light and fluffy, liberally dotted with currants. Liked this? Then don’t forget to check out the Coffee Spot Guide to Brighton & Hove for more great Coffee Spots. This entry was posted in Brighton & Hove, Cake, Coffee Shops, Laptop Friendly and tagged include, Monmouth by Brian Williams. Bookmark the permalink.